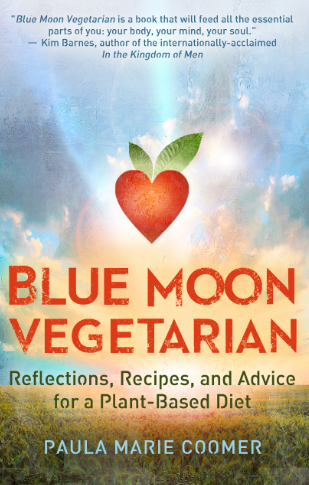 Blue Moon Vegetarian: Reflections, Recipes,and Advice for a Plant-Based Diet is part memoir, part cookbook, and part health-and-nutrition how-to, and chronicles Kentucky-born former nurse Paula Marie Coomer as she and her fiancé go vegetarian—and ultimately vegan—while also planning a mid-life wedding, adopting a pound hound, and remodeling their two-story Victorian. Writing with honesty, humor, and sometimes despair, Coomer tells the story of two people alternately thriving and suffering as they adjust to a new way of eating, living, and loving. With advice from a former public health professional and over fifty original, tried-and-true, plant-based recipes, this thought-provoking bookk is perfect for anyone concerned about their own health, the health of their loved ones, and the health of our planet. Nineteen years. Nineteen years since a blue moon coincided with New Year’s Eve the way it did at the feeble end of 2009. A year to make me say thank goodness when it was finally gone. Just a day before I’d learned of the death of beloved experimental writer Raymond Federmann, with whom I’d studied when he came to the University of Idaho as a distinguished visiting writer back in the 1990s. A professor who spent a week sewing feathers onto our wings, daring us to chart our own routes, and who relished riding around in our grungy cars and hanging with us during the after-hours. The fifth of my life’s top influential people to leave the planet in 2009. The year was enough to awaken the curmudgeon in me: first, a long-awaited vacation in San Francisco, my favorite city and a place to which I’d waited thirty years to return, botched by a torn meniscus. Then, knee surgery and months of leaning-on-a-cane recovery, during which my father’s heart had to be opened and reorganized. My best friend/father Frankensteinerized, zippered in the chest. And his daughter the nurse, incapacitated herself, 2,000 miles away. What’s worse is that I’d allowed those losses to overshadow the good things about 2009: my youngest son’s wedding to a woman we all adored; several trips prior to the San Francisco trip—some for work and some with my fiancé, my engagement to whom also occurred in 2009 after nearly twenty years of singledom—Oregon, Illinois, Massachusetts, Kentucky, Texas. A novel I wrote recorded for radio and having a go as an audiobook. The last blue moon on New Year’s Eve occurred in 1990, which was the year my second marriage fell apart, the year I began weightlifting, and the year I became a vegetarian for the first time. I say first because I was about to do it again, coinciding with this New Year’s Eve blue moon. Beginning January 1, 2010, my status as your average organic-foods omnivore would expire. A little dairy, still, perhaps, in the form of yogurt and half ‘n’ half, since it would take the planet slipping off-course to unbind me from coffee, a thing I’ve repeatedly declared I endure only as an accompaniment to cream. Once in a while, eggs. But no more animal flesh. No more creatures of the sea. I was doing it because, having turned fifty-three in September, and having been told by my medical practitioner, “It’s time,” to start chewing that daily baby aspirin, and having a father and grandmother who developed Type 2 diabetes at just my stage of life, and having gained more than one hundred pounds since I started eating meat again, stopped weightlifting, and became a writer, I felt I had no recourse. If I wanted to live into the Georgia O’Keefe years—which I did—I was going to have get fit. I was also doing it because I’d stopped trusting our food system. Throughout my life I’d eaten almost exclusively organics, and as the daughter of hundreds of years of Scots transplanted to the south-central Kentucky hills and Cherokee and freed Africans, the diets of whom consisted of nothing they did not raise, hunt, or gather themselves, and who knew nothing of fertilizer save manure and never dreamed of the need for a product such as a pesticide, since they knew which plants repelled such organisms and arranged crops so that one plant protected the next. Laying hens and frying chickens roamed the rows to scavenge rare bugs like tomato cutworms. I had come to suspect my body was genetically programmed only to consume whole foods. In fact, I believed that about us all. My gut had never done well on Doritos and McDonald’s, and as the years went on, it wasn’t doing so well on muscle fiber. Whether it was a way of me taking control of my life, or my body sounding its warning bell, I could only say, “Let it begin.” It was about seeing what I still had left in me. My fiancé, Phil, who works as a federal contracting officer, decided to share these goals, sane and pragmatic person that he is. He is also a fabulous cook and an inventor of original dishes. And since 2010 was our wedding year, and we wanted to be healthy and active together for decades more, it made perfect sense that we use the experience of lifestyle change as yet another way to discover the deeper parts of each other.